At the start of the July 2017 school holidays, we visited the beautiful NUBO indoor play space in Alexandria in Sydney's Inner East. 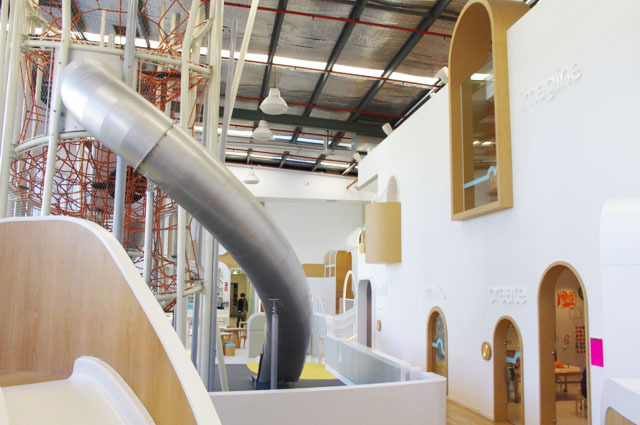 It is such an inspiring space which is both fun and educational for little ones. And since May 2018 NUBO Chatswood was born, to read our review of NUBO Chatswood head here. As soon as we walked in, the kids were so calm in the serene space. They were happy venturing around the library and relaxing in the reading nooks and hot hair balloon. They enjoyed story time where an instructor read a cute book and played some little tunes on his guitar. They didn't venture down the giant slides as it is more suited for kids 4+ and little Miss was a bit scared of the slope on those slides but I'm sure she will get the courage next time we visit. The space is truly appealing to the eye. 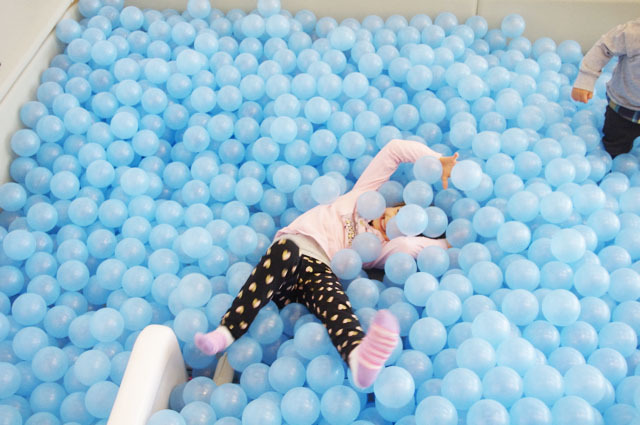 Parents can relax at the café while they watch their little one playing in the ball pit. Kids can explore other spaces and build in the blue room with Big Blue Blocks, Gears and MagFormers. Or do some crafts in the craft room where an instructor runs craft activities during the day. Little Miss enjoyed playing with clay and creating her own medal on Olympic week. The most popular section of Nubo would have to be the ball pit where everyone was floating on the balls and going down the super fast slide. There is an upstairs section where kids can play shop and have a tea party at the café. Little Miss and her brother loved this space and looking over the centre. We loved NUBO Alexandria and will definetely pop in next time we are in the area as little Miss often asks me when we will go back to the 'new playground'. Checkout NUBO Alexandria's What's On page on their website to see the 'Theme of the Week' and what activities have been planned in the library, art studio, building room and workshop room. A few NUBO reserved parking spots can be found next the centre with a reasonable parking fee or other parking can be found in the other car parking areas in the business centre. Arrive as NUBO Alexandria opens before the crowds come for the morning activities so the kids can enjoy the space alone. Bring socks for the kids and yourself as the centre does not allow shoes for adults and children (even in the toilets) so bring your socks with you on the day. The centre is open 7 days, caters for children 0-10 years. Prices vary depending on the day you visit and how long you stay so checkout the Visit page on their website. Activities are included in the entry fee which is great. There are toilets onsite including a parents room with a change table as well as a kids bathroom with an out of world cool 'octopus' sink with taps. A Nubo will be coming to Chatswood Chase towards December this year so keep an eye on their social to stay in touch. To find out more about NUBO Alexandria, their program and where they are located, head to their website. 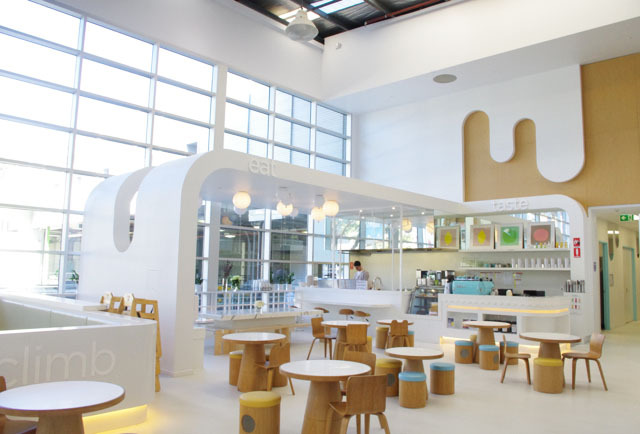 To read up on our review of the NEW NUBO Chatswood in Chatswood Chase, head to this website.